Our software and database department specialise in custom designed business systems that work... cutting the paperwork and automating the time consuming processes you do manually. We have developed systems for businesses as diverse as wholesale and retail distribution, Car Valeting and many others. We develop the system that YOU want, for a budget you can afford. Rather than have to design new procedures, new forms, and retrain staff, our systems will use existing forms and existing staff more effectively. You do not have pay for extras your business does not require. You do not need to upgrade just because the old system will not be supported after a given date. See details of our contact management system here. You may already have a Database or Spreadsheet solution that is limited and does not produce the outputs you want. We can develop your current system, retaining your existing data, to provide extra information, e.g. Management Summaries, Cashflow forecasts and Budget Summaries. As it is custom made, your system can easily be modified to take account of different circumstances. As the business grows and changes, we can develop your system to suit. All our systems include installation, a step by step printed manual and two hours of training. Additional training can be provided if required. Our innovative systems are usually designed using VBA and Microsoft Access, SQL Server or Excel, allowing many users to input and output data simultaneously. Our software can interact with Word and the Internet to produce standard letters, graphs and e-mails at the touch of a button. 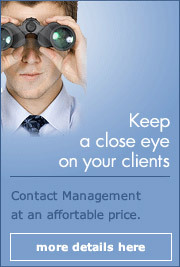 See details of our contact management system here. Need more than just Software? We provide Consultancy, Training, Hardware including Networks and Website Development and graphic design, ideally complementing our service. How does it all work? We offer a free initial consultation where we will look at your current system in detail. We will analyse it and produce an estimate for each part of the work. At this stage we can incorporate any changes or modifications you suggest. If the work could be broken down into sections easily, we are happy to develop a part of the application first, so that you and your staff can evaluate it, before proceeding to the next step. We have designed many systems with different levels of access for different users where certain screens are visible or can be changed only by certain staff members. Although we design principally in Access using VBA, we can produce Word and Excel Documents, CSV Files and send e-mails from within the same application. This means that once the data is stored, no retyping ever needs to be done. For less than 20 users, we usually base our systems on Microsoft Access although we have designed several applications using Microsoft Excel and Visual Basic. For larger systems, we use Access or a Web based front end and SQL Server which can be configured for many users. Contact us on 0845 330 2550 to discuss which software is best for you, if you are not sure we and our IT consultant can help with an overall strategy. An off-the-shelf software package can look a good choice, but does it really meet your needs?